To get the most out of your massage, make sure that you are relaxed before you enter the treatment room. You finally splurged for a massage. About halfway through the treatment, our minds finally start to wind down, our thoughts start clearing out, and we leave ourselves with about ten minutes left in the treatment in which we are actually relaxed. Only to be woken out of the slumber we started to slide into, to be told “time’s up”. Undress. Don’t rush in and out of the spa. Take the time to go into the locker room, undress, put a robe on, slip into slippers, and retreat into the environment of the spa. Drink. Pour yourself a glass of tea. Most spas have a tea bar with a few options for you to sip on. This will help to warm your body up, and prepare it for relaxing. One of my favorite teas before a massage is the Detox Tea from Higher Tea. Designed by naturopath Sophie Howard, it is the perfect choice to relax with. Relax. To get the most out of your massage, make sure that you are relaxed before you enter the treatment room. Most spas have a relaxation area of some sort, albeit a small sitting room where you can have some quiet time before the treatment, or an incorporation of soaking mineral pools and baths. If your spa has the latter, by all means, take advantage of it. There’s nothing like a mineral pool soak, fresh air, maybe sitting in the sauna to calm your body and your mind before entering the room. The best way to relax before a spa treatment is to take advantage of spa amenities like thermal mineral pools. 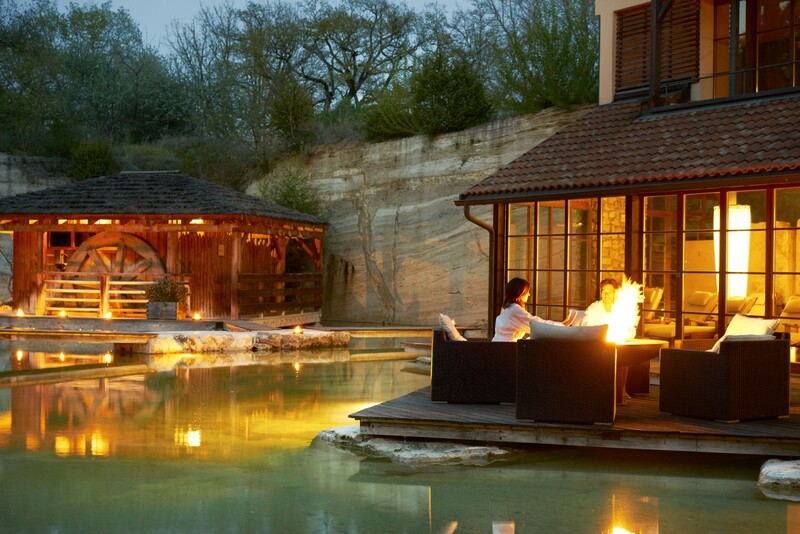 Pictured: The expansive mineral pools at the Adler Thermae Spa in Tuscany. Breathe. Deep breathing enhances the benefits of a massage like nothing else. In the moments you are waiting for the therapist to come back in the room, close your eyes and start breathing. A simple meditation in counts of ten, or just some slow deep breaths will do the trick. During a Haki Treatment at the Adler-Thermae spa, the therapist actually instructed me to lie still and breathe for five minutes after the massage was finished. I noticed a huge difference in how relaxed I felt compared to how I normally do, when I simply just get up and get dressed. Deep breathing promotes the flow of blood, lowers your heart rate and blood pressure, increases the effectiveness of the lymphatic system, and detoxifies the organs. You can simply relieve stress by breathing, which goes hand in hand with the goals of a massage. Quiet. Don’t talk. Most of us wouldn’t dream of talking during a massage, but there are some therapists that love to talk, and clients that do to. If your massage therapist is encouraging conversation and won’t take the hint, just close your eyes and don’t respond. They will get the hint. Talking isn’t relaxing. Close your eyes. Your eye movements will keep your brain alert and focused on what’s happening around you and not on receiving the therapeutic benefits of the massage. Sleep, meditation, yoga, and rest all require you to close your eyes. Slow down. Focus inward.